The MCR Safety Winter Lined Water-Repellent Palm-Coated Work Gloves WL1048HP have been designed to shield the hands against mechanical hazards and protect against water and cold. This is achieved through the use of a double-layered liner consisting of nylon and terry fabric and a water-repellent PVC Sponge Touch palm coating. Providing outstanding grip in wet and dry conditions, these versatile work gloves are suitable for a wide range of applications, from construction and agriculture, to automotive work and warehousing. 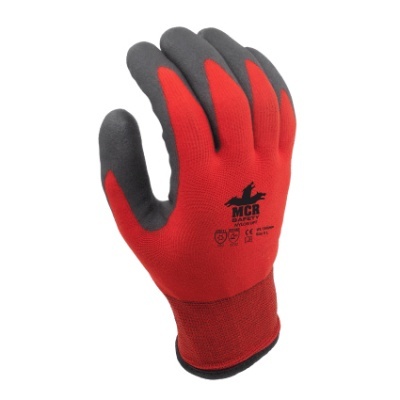 The MCR Safety Winter Lined Water-Repellent Palm-Coated Work Gloves WL1048HP are available in sizes 7 - 10, one of which should suit the hands of most users. Please measure the circumference of your hand around the knuckles (excluding the thumb) with your hand open and your fingers together, and the length of your hand from the tip of your middle finger to your wrist.